Cold brewed green tea is a refreshing delicious summer thirst quencher. Easy to make and stored well for those hot humid days outdoors! We are recent converts to cold brewed coffee, but have been making cold brew green tea for several years now. I can be quite contrary in my my tastes (after all one of my middle names is Mary), I like my coffee black and rather strong, and my tea also black but very weak. Tea bags just do not work for me as even one in a pot is far too strong – granted you can whip it out immediately the hot water hits it, but you do not get all the flavours extracted, and although I like weak tea, I also like a balanced brew. Usually when I make tea I put a few leaves into a mug, top up with hot water and leave to infuse. 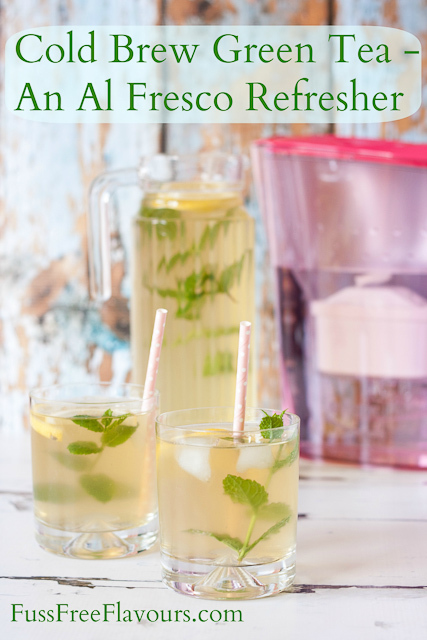 For an overnight cold brew you do need a little more tea – and I find one teabag is about right for a litre jug of water, my favourite is Clearspring’s sencha – a clear, bright and refreshing drink. Even if you think you do not like green tea do try this; it is a different drink from the bitter over extracted brews served in tiny bowls in Chinese restaurants. Since the start of the year I have been a BRITA ambassador and have been drinking filtered water – and a great deal less alcohol – it has made a massive difference to our coffee and tea which is brighter and clearer with none of that nasty scum floating to the surface. We have also been thinking about water as an ingredient. The iced tea above is pretty much clear – the condensation on the glass makes it look cloudy. 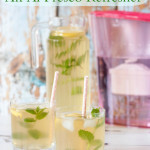 It is worth finding a slim jug that will fit into the fridge door – you can make this in an empty bottle, but it is near impossible to fish out the lemon and mint and reuse it. This is perfect for on a picnic, or at your desk. If you try this Cold Brewed Green Tea & Al Fresco Dining Tips please tag #FussFreeFlavours on Instagram or Twitter. It is amazing for me when for me when you make one of my recipes and I really do love to see them. You can also share it on my Facebook page. Please pin this recipe to Pinterest too! Thanks for reading Fuss Free Flavours! Simple place all the ingredients into a jug and leave to infuse overnight.